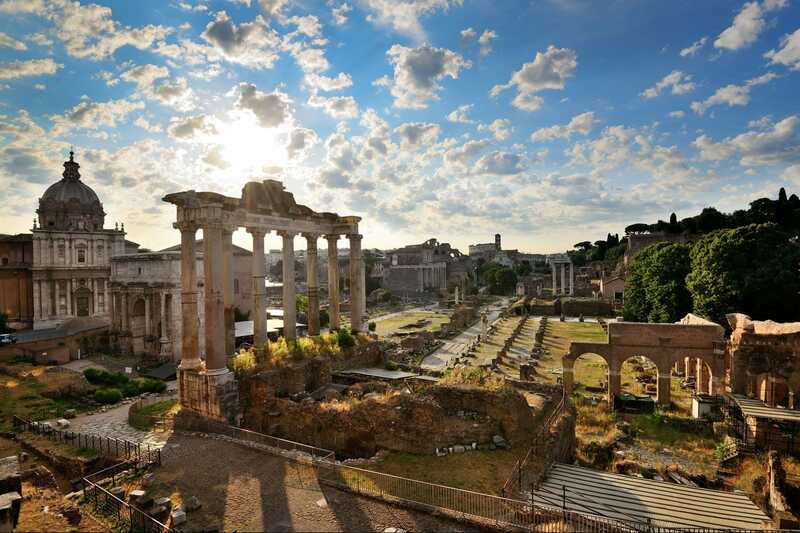 At the Roman Forum you will find the ruins of several of Ancient Rome’s most significant buildings. The site was originally marshland. But it was drained by the Romans and transformed it into an economic, political and social hub. The Roman Forum’s earliest buildings and monuments date back as far as the sixth century BC, and the latest addition was around 600 AD. It was common for emperors to make their mark on the Roman Forum Rome and add to it in some way, in an effort to try and out-do their predecessors! The local Romans referred to the site as the Forum or the Forum Magnum. It was such a large part of their lives because it was here that processions or triumphal marches, criminal trials, executions, cremations, speeches or elections took place. There were monuments to the empire’s greatest characters too. Near the entrance to the Roman Forum Rome at Largo della Salara Vecchia one of the first sites you will pass is the Tempio di Antonius e Faustina on your left. It was built around 140 AD and the emperor Antonius Pius dedicated it to his late wife. It was later dedicated to him when he passed. And it was later converted into a Roman Catholic Church as early as the 6th Century. As you walk on from this site you’ll also come to Via Sacra, which was the main street of the Forum, and it’s here that the Tempio di Guilio Cesare is located. Emperor Augustus built it and it’s the site where Julius Caesar was cremated. Following the Via Sacra further will also lead you to the seat of the Roman Senate - the Curia that was nucleus of political power in the Roman Empire. The Curia was converted into a church in the Middle Ages however it was reconstructed in the early 20th century in an attempt to show visitors how it would have looked in the 3rd century AD. Towards the end of the Via Sacra one will then come across the 20+m high Arco di Settimio Severo or Arch of Septimius Severus. It’s a white marble structure that’s named after the emperor of the same name and commemorates his Parthian victories of 194 – 199. It is one of the most visible remains inside the Forum. It’s here you will also find the remains of the Rostra. A large platform from where speakers would deliver orations. It is here that Shakespeare had Marc Antony deliver his famous ‘Friends, Romans, Countrymen…’ speech. In the vicinity of the Rostra you’ll also see the eight columns – the remains of the Tempio di Saturno that was once the Treasury and is one of the earliest Forum temples. Still on Via Sacra, you’ll also find the Basilica di Massenzio – the Forum’s largest building, which originally measured 100m x 65m, dating from 312, was a marvel in Roman engineering and was the last significant expansion of the Roman Forum. From around the 6th Century, some of the buildings in the Roman Forum began to be transformed into Christian churches. In Medieval times, the memory of the Roman Forum remained but the site began to fall into disrepair and was neglected. It was filled in with a thick layer of earth and became known as the Campus Vaccinus – or the cattle field! And during the Renaissance it was used as a marble and stone quarry for building projects elsewhere. Excavations began in the 18th Century and these continue today – alongside constant restoration and preservation. Our Grand Day Tour of Rome – three excursions in one This is an intimate tour where you and seven guests will have an experienced guide take you on a tour of the Roman Forum, the Colosseum, Constantine’s Arch, Palatine Hill, the Vatican, Sistine Chapel, St Peter’s Basilica – as well as evening visits to the Spanish Steps, the Trevi Fountain and the Pantheon. It includes skip the line tickets so you can make the very most of your time in Rome. 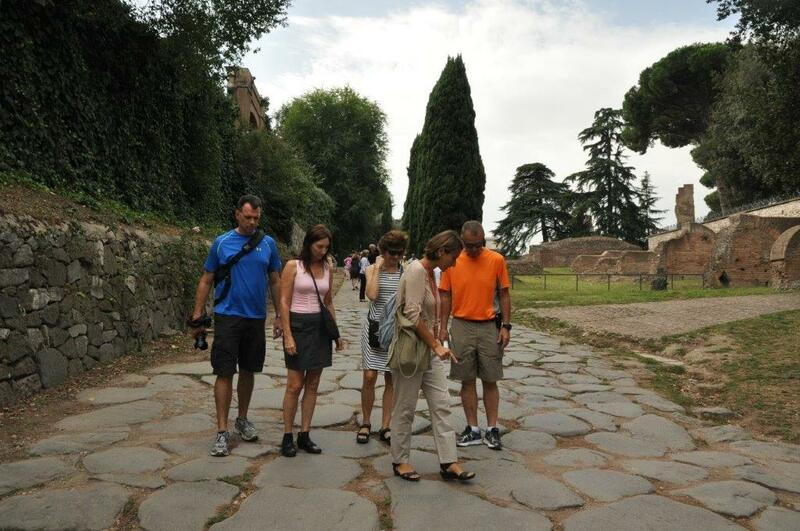 Our Small Group Tour of Ancient Rome. Again, with skip the line tickets, this three-hour tour takes in the Roman Forum, Palatine Hill and the Colosseum. Our Classic Ancient Rome tour is a six hour tour takes in the Roman Forum, Palatine Hill, the Colosseum as well as the Catacombs, Appian Way and St Clemente Church. View all of our tour options in Rome here. Also, if you are looking for some travel inspiration, check out our other blog posts at tours-italy.com/blog/ It’s a great read about all things about all things Italian and Italian holidays!